The ProSPER.Net Secretariat would like to extend a warm welcome to Mr. Hiroaki Takiguchi, the new Project Director for the Education for Sustainable Development (ESD) Programme at UNU-IAS. Mr. Hiroaki Takiguchi served with the Ministry of the Environment, Government of Japan (MOEJ) for over 20 years, where he served as the Director for Environmental Health and Safety Division from 2017 to 2018, overseeing and providing strategic, policy and technical guidance on hazardous chemicals management. From 2011 to 2014, he worked as a Senior Environmental Specialist at the Global Environment Facility (GEF) Secretariat in Washington DC, where he worked on the focal area of sustainable transport for climate change mitigation as well as that of hazardous chemicals management. He is a Japanese national with a Doctor of Engineering from the University of Tokyo. We would also like to take this opportunity to thank the outgoing Project Director Mr. Naoya Tsukamoto for his leadership and substantial contribution to the ESD Programme and ProSPER.Net over the past two years. The ProSPER.Net Joint Meetings, the 12th General Assembly and the 18th Board Meeting, will be hosted by Universiti Teknologi Malaysia (UTM) on 23 October, 2018, in Johor Bahru, Malaysia. Members who are attending are asked to complete the registration form (sent to members via email) by 24 August, 2018. A reminder that applications are currently being accepted for membership to ProSPER.Net for 2018. 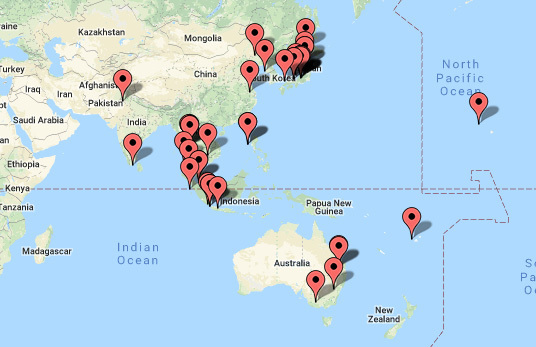 Membership is limited to higher education institutions located in the Asia-Pacific region that offer postgraduate education and research in sustainable development and in education for sustainable development-related fields. The deadline for applications is 31 August, 2018. More details on applying for membership can be found here. The International Solid Waste Association Young Professionals Group (ISWA YPG) is running a global campaign #WhatHappensToMyWaste to raise awareness about how waste is dealt with around the world and how to prevent waste at source. 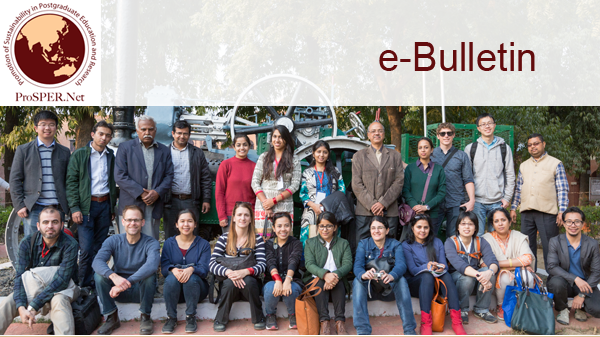 A survey is being conducted to collect information on waste education initiatives and waste facilities worldwide, of which the data will be used to conduct a gap analysis to provide key insights on waste/resource education globally in the form of a report. Here’s your chance to participate and contribute! Complete the survey here by 31 August, 2018. Schools, recycling companies, NGOs, and other ‘waste educators’ taking the survey are also eligible to apply for the ISWA YPG Education Award, designed to recognise excellent Waste Education concepts, materials, projects and lessons. Further details about the award can be found here. 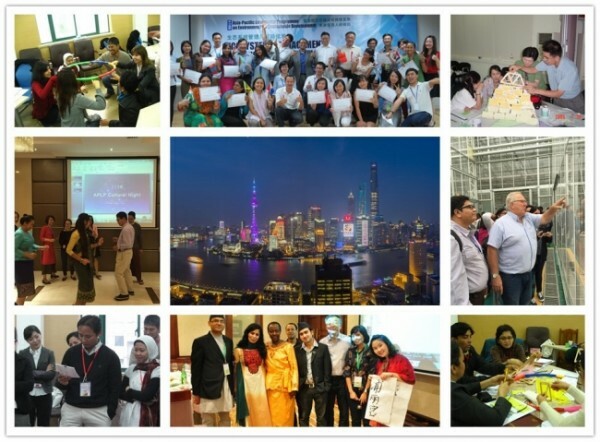 Co-hosted by the United Nations Environment Programme (UN Environment) and Tongji University, the Asia-Pacific Leadership Programme on Environment for Sustainable Development is an annual programme for emerging leaders in the region that aims to build capacity on holistic sustainability thinking and evidence-based approaches for effective action. This year’s programme will be held 17-21 September, 2018 at Tongji University, Shanghai, China under the theme ‘Resource Efficiency and Sustainable Development’. For more information about the programme including the application process and selection criteria, visit the website here. The deadline for applications is 10 August, 2018. A research team from the Inter-University Sustainable Development Research Programme (IUSDRP) is inviting participants to partake in a survey to contribute to an international study on carbon management practices at higher education institutions. The study will carry out a comparative analysis of universities’ experiences of implementing carbon management. The research findings will be presented through a global webinar, which will be hosted by the Environmental Association for Universities and Colleagues (EAUC), UK, with the study and its results to be published in a major academic journal. Interested participants are asked to complete the survey here by 29 July, 2018. 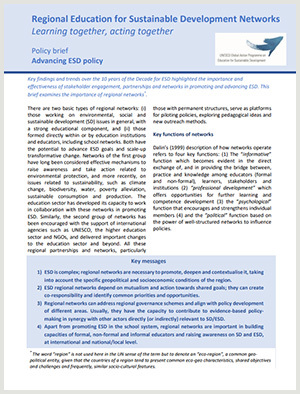 Developed by GAP partner network 1, this policy brief examines the importance of regional networks for supporting, promoting and advancing ESD policies and practice. It highlights the role that regional networks play, including the ability to connect global SD/ESD agendas to regional contexts, with reference to the ProSPER.Net network and how its multi-disciplinary solutions are responding to sustainable development challenges. Read it here.